Bobby – what a great review and a great comparison between the three apps! I think you’ve summed it up great … including Springpad’s “secret sauce”! I couldn’t agree more … and thank you so much for the amazing recommendation of my book!! No worries man. I’m sure it will help people to get a solid feel for the new Springpad and how it can work for them. Thanks for the great review Bobby. Our goal with this redesign is to make it even easier to share and discover with those you trust for the things that matter to you – be it friends, family or co-workers. And, if users just want to use Springpad for personal note-taking or task management – that’s fine too. Above all, our vision is that we want to be useful to people when they want to get something done. I definitely got that feeling with this iteration, Jeff. You guys have put some serious work into defining what Springpad is and is going to be — and the new design definitely reflects it. I love it! You should check what users are saying about this redesign. Moving Springpad from Organization app into a Social Network made too many unhappy users. @Rafael – I’ve been on the support boards. There are a few bugs and some confusion, which is normal for such a big change, but, when I looked, things were definitely positive. There will be a few bumps, but what Springpad is aiming at — where they’ve been headed for a while — is definitely better served by the changes. I think they will only grow from here. You must not have looked very hard. The discussion at getsatisfaction.com is running 82% terrible, 9% bad and 9% good. Users are very unhappy with the upgrade. It was yesterday evening sometime — I’m sure all the naysayers hadn’t had time to weigh in. I just took a peek again and there are definitely some people with valid concerns. I maintain I like the new direction, however — but it seems like Springpad should have done a better job informing their users (especially power users) about the changes. Maybe a gradual entry with the ability try it out for a while, much like Twitter and Google did with their redesigns. I understand their desire for secrecy and surprise, but in this case, I wholeheartedly agree that user participation and a transparent ease-in would have been a better approach. Actually, the Springpad upgrade issue is not only bugs. I mean there are bugs as in all my previous data was completely wiped out. However, the re-design is just not functional. It took a great application and tried to turn into something it isn’t Pinterest. Springpad was always a task related app, now it’s social networking, pinning, and tasks last. I would disagree that Springpad was always task related — by related, I’m assuming you mean focused? Since its inception, it has been about capturing information in buckets that are useful to you and make it easy to find later, and providing contextually useful information to augment what you put in those buckets. That last is important, as it’s the main part of their business model. In fact, it’s probably the main reason behind a lot of their major changes, over time: how to catch more users, how to get them to save more information we can augment with our partner companies, how to get them to put at information in front of more eyes — and therefore remain relevant, be profitable, and grow rather than go the way of the dodo. Tasks are not generally information that can be augmented. The ability to add tasks and reminders does catch users, and it caught on for them, especially as an alternative for Evernote, but it has never been what Springpad was about. @Bobby, I don’t agree with you at all. For many of us, Springpad was an Evernote Alternative. Now it’s not anymore. Now is another Facebook-like thing, with followers, comments and social everywhere. And some of us didn’t wanted another social thing (I’ve enough yet with FB, G+, Twitter and Tumblr). I wanted Springpad to save and sort the things I was finding on the Internet, to organice projects and tasks attaching notes and attachments to it. Now, the notes are comments! That is not respect for the customer data, they’re playing with our data. When Google introduces a big change, you have the option to test the new interface and, if you don’t like it, turn back to the older. Here, yesterday I went to bed with my notebooks, and today I woke up with Pinterest instead of Springpad! Also, this is the 3rd time they totally redesign and change all of it, and that really confuse and tire the customers. And the iOS app is deplorable. I don’t understand why companies make totally different design for desktop and for devices. You totally lose the feeling of being using the same service (look how Trello do it perfectly well). I understand your point of view Almarma, and I sympathize. Unfortunately, I don’t think Springpad ever really meant to be an Evernote alternative — at least, not in the face of the juggernaut Evernote was becoming. They always intended to be something more, something that was contextual in nature. They always intended to take the digital notebook and give it life — and with the evolution of social media, it only made sense that they kept building in that direction. As I mentioned in the beginning of my post, what Springpad has done with their functionality wasn’t really a change — they’ve had the infrastructure in place in some form since the beginning. They basically just took the gloves off, updated to fit modern standards and trends, and beefed up the social capability. It may not be what you envisioned for the service — and I’ve been right where you are, so I understand — but to remain relevant and to grow into what they are meant to be, the change was needed. The alternative may have been that you were left with no Springpad at all — something that can happen overnight in the tech world (to a user perspective, anyway). I totally agree with this comment. I tried using it for about a week and actually deleted it. I mean I already have Pinterest and Facebook. They are both great, but this app was filling a completely different niche. When it changed it’s formula, it just overlapped with applications I already have. I really don’t feel the need to share my tasks list. Social media is great but it was nice having an app separate from all of that. I liked opening it and actually focusing on the things I needed to do. This is a fair comment, and I totally agree with your reaction. If you are certain that something will no longer fit in with your workflow, then you should kill it, immediately, rather than drag it out. I give you credit for putting it through its paces, and quickly acting on your realization that it won’t work for you in its new form. I also sympathize with your frustration — I’ve been there with different apps, and have had to do exactly the same. Much of the complaints are about issues due to Server Overload. In my opinion, up to some point, that’s acceptable and I know they going to fix that. My main concerns are about the new UI design. Is it beautiful? Yes! Is it user oriented? Not at all! The new design makes using this site painful. Specially for those that had already created an organization system around the previous version features. Navigation got complicated and what could be done with one click, now needs two. If the goal is to turn Springpad into a Pinterest like Social Network, they’re probably in the right track. But in order to do that, Springpad ignored some features that makes Evernote a better app and that users have been requesting and eagerly waiting for years. 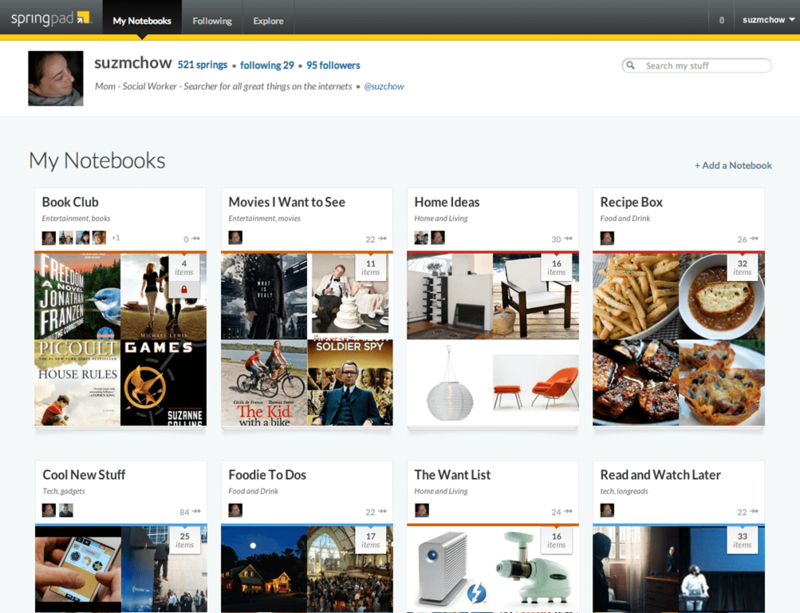 Such as: Improve Sharing options, notebooks Inside notebooks, better writing features and many others. Sharing itself, despite collaboration, had no improvements at all. You’re still not able to share a single note, without displaying all your notebooks content. So, It’s all or nothing. This alone is enough for me not using it for really important stuff, that sometimes needs to be shared with someone else. They need to define who they are going to be and do it as fast as possible. I fear that this move will just throw Springpad in some sort of App’s Limbo. 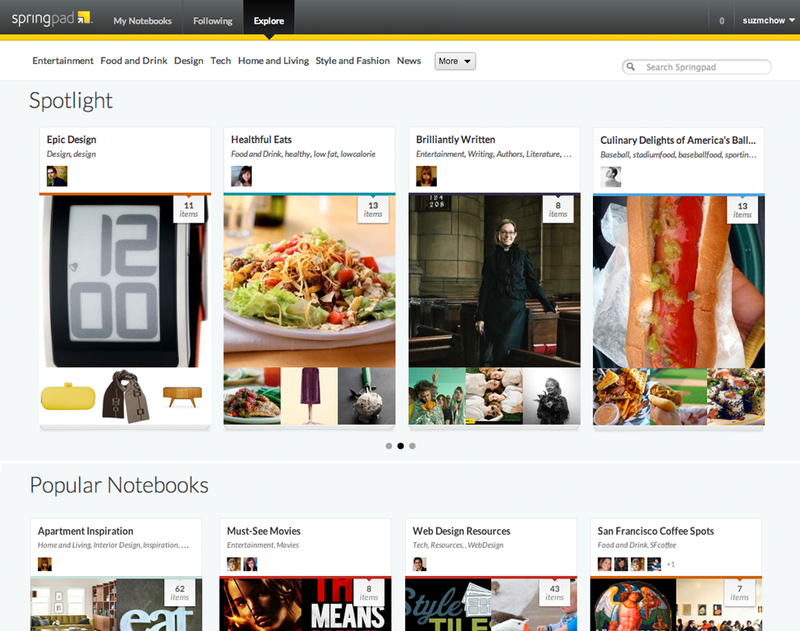 It might just get stuck in between Evernote and Pinterest. I agree, Rafael, there are some tweaks that need to be made to the UI. Little things like not being able to scroll down with the arrow keys and other such annoyances are problematic. I’m waiting to see what sort of user feedback on bugs and features they receive and respond to before I complain, however. Make your voice heard, and the issues may just come out in the wash. In fact, I already discovered one thing that bugged the hell out of me — the extension made it very difficult to actually get things into my notebook the way I wanted. I did a little testing and found a workaround: the bookmarklet gives you way more control, and works perfectly. I made sure I mentioned it to the team, and they assure me they will be looking into it. I confess, I didn’t notice the issue with sharing single notes, and I agree that is a feature/issue that needs to be addressed. I’ll look into it myself after work. As far as defining themselves, I think they’ve done that. 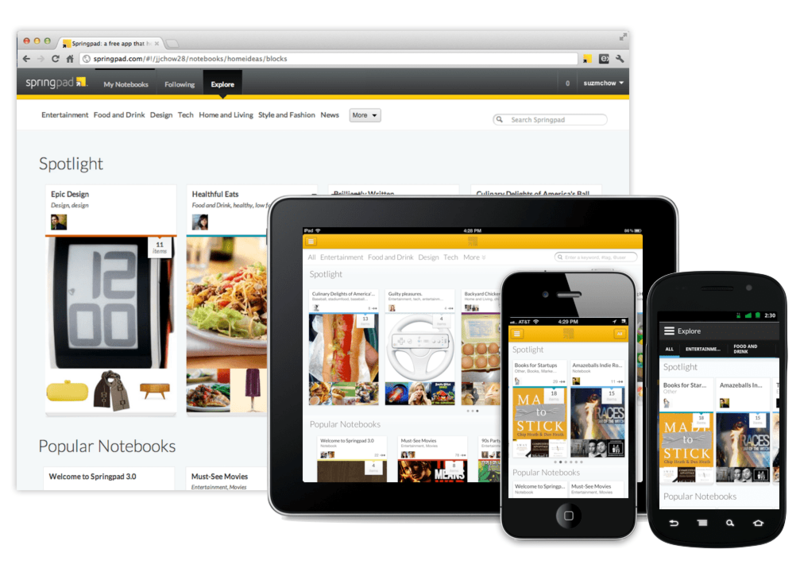 Their main goal is to be a “smart” contextual notebook. To have collaborative features that allow people to curate and act on ideas, and gather inspiration and knowledge from a trusted user base. That is not Evernote and that is not Pinterest, or any other service that I’ve found out there. It does contain elements of each, certainly — and if Springpad can steadily hone in on and improve upon that idea, they could create their own niche. That, I suspect, has always been their true goal, no matter what we ever thought (remember, I was one of the major voices on the vs Evernote train…). I was a fan of Springpad for about 3 years, participating on Get Satisfaction trying to make Springpad better for our needs and beeing happy with the several updates, the chrome extension, the widgets on android and go on, but now really they made a big big fail. Let’s suppose that the update make all working great, but its all broken, son unprofessional update. It has to be a MUST to bring to users the option to use the old interface instead. You can’t make a such big update with so many bugs and changes. I sadly will back to Evernote instead. I believe that this change is for the Pinterest boom, and with Springpad you could make the same things, but Springpad is just different. Is for make notes, clip webs, recipes, movies, books, tasks lists, grocery lists, organize them on notebooks, etc,and ALSO you have the possibilty to share all of this thins, but the main purpose of Springpad is and to save personal things and interests and be in some way more organized and productive. So sad Springpad. I wish you go back for what we love you someday. I hear what you’re saying Lucas. I think that, because I stopped considering them an Evernote replacement a while back, and started utilizing them in other ways, the change wasn’t hard on me. It’s not a part of my everyday workflow, but more of an enhancement to what I do online and when out and about, and the new features make it even better, in my opinion. I don’t see a real loss in functionality, because everything I am used to doing with it is pretty much still there. If my workflow were centred on Springpad, my reaction would likely have been more toward the “AHHHHHH” — because it’s my workflow. My everyday routine would have to be rethought. Even if it ends up being better in the long run, there is no way that won’t cause stress. Hopefully, people will be able to give the new version a chance, and will be able to use it for what it is becoming over what they hoped it would be. And when I say what it’s becoming, I don’t mean Pinterest. I can’t get in to Pinterest. It does very little for me, and seems more like a way for me to waste time than to get anything done. For my job, I have to use and understand it, but it doesn’t do much for me, personally (my wife loves it, though). 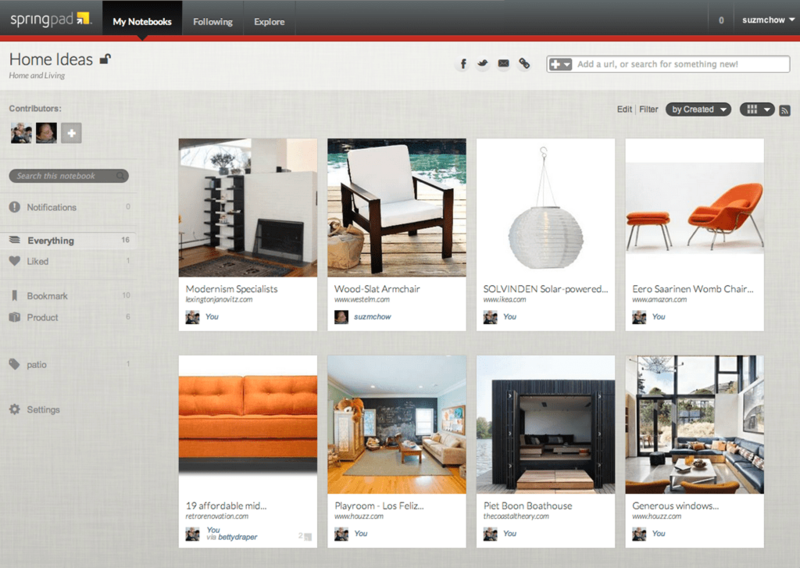 If Pinterest had some of the actionable features of Springpad, though, I might have loved it more. I’m not participating in the getsatisfaction discussion bc I hate having to login. I just wanted to say that I became so fond of Springpad in the few weeks I’ve been using it and now feel sad, frustrated and upset. I’m wondering if I’m already to the point of no return with the info I’ve loaded over there (which btw can’t bakcup for now) and stick with it even tough I dislike it or if I can still swith to another app… but then which? I have no idea. Any suggestions? I’ve read reviews of so many and none seem appealing enough. Hey Pizza – Try clearing your cache, then run your backup again! I wasn’t a huge fan of Springpad before, but I thought it had potential and given the ongoing text formatting problems with Evernote on iOS I had hoped that it would develop into a usable alternative, even if that wasn’t its intended purpose. However, with the latest update it has moved even further away from what I need (a research tool capable of creating, editing and managing long text notes, and lots of them) to what I don’t (light weight sharing, liking and social networking). It also crashed several times while doing nothing in particular, something it hadn’t done in the past. And when I emailed an HTML email into it, it took several minutes to show up and when it did the font was too small to read with (apparently) no way to zoom. At that point I deleted the app from my phone. Sorry, wrong type of customer! Thanks for weighing in, Nina! Unfortunately, the press announcements surrounding this update focused mainly on the the social feature. But in reality, the main new feature is Collaboration, which is meant to help out users who want to privately share with family and co-workers. The social collaboration possibilities of Springpad were one of the things that interested me in the past, and I’m glad to see that the service is starting to realize its potential there. I hope that the ability to share individual notes from a protected notebook will happen soon, however. Being able to share an item to “whoever has the link” like Google Docs or Evernote would be the sort of feature that cools the jets of the shocked and angry — and it would be handy, too! I’m glad you wrote that Springpad shouldn’t be compared to Evernote, because I’m really not ready to switch to something else than Evernote, even if it might be better :) I’m so deep into Evernote that having go learn a whole new app/system and export/import my stuff, would take a lot of time, I’m afraid. Still, I can’t help to be a bit curious about the GTD part in Springpad, I wonder if it’s worth taking a look at compared to a web-based app such as NirvanaHQ which has a pretty sweet GTD system. Springpad can be utilized for GTD, but you have to make allowances and figure out your own workflow as that isn’t its focus. I did a GTD in Springpad post a while back (linked in the post above). I don’t see why the principles shouldn’t work with the new version, but I haven’t looked at it in detail yet. Hi Bobby and Thanks for the followup. Good to hear about Springpad people too. I’m using sp like an auxiliary brain. Note taking, attaching files to notes, product research, bookmarks, web clipping, recipes… pretty much “everything” to organize pieces of unrelated info I need to have at hand. Use the Chrome and Firefox extensions as well as the Android App. Tried One Note years ago, and liked it but needs an Office license and not sure if Android supports it. @Katin thanks for the tip, unfortunately it didn’t work. From what you’re saying, Pizza, Springpad is the perfect app for you. OneNote is pretty much Microsoft exclusive, in my experience — but I abandoned it a long time ago. I think the question here is, what about the new Springpad is bugging you? If it’s problems with the extension, switch to the clipper bookmarklet. It actually works better, at the moment, and offers more control. Thanks Bobby I’ll try the bookmarklet. I dislike notes being treated as comments; adding new notes takes forever, apparently it is forcing a web search. The android app seems to be less affected though. I rely heavily on it too. I’ll start testing Evernote and keep both for a while before making a final decision. BTW I was able to do the backup now. If you check lower in the comments, I posted the list of fixes that were done up to yesterday morning, and some that are on the way. The extension clipper is working better now, for example. i love previous springpad for its simplicity & speed. with the new springpad, while the new UI looks pretty, it’s not practical to navigate those huge notebook icons, besides all the images slowed down speed quite a bit. I didn’t notice a significant slow down. I kind of like the big notebooks — and found myself mildly annoyed that the iPad app didn’t have them in the My Notebooks interface. It looks like they will be trimming them down, however, in some updates that will be happening in the near future — there was some mention of Wednesday, but don;t quote me on that. Glad to hear not everyone was affected negatively — and is willing to speak up about it. I agree on the clipper. The functionality of the Evernote and Memonic clippers would be a great and useful addition. I had recently decided to use Springpad for personal stuff, and Evernote for work stuff. Was excited about the upcoming enhancements. Since the “upgrade” on Wednesday, my attachments have been unavailable. That means that the system has been DOWN for 3 days. None of the other things matter, my information is unavailable, so for me, the system is down. That’s utterly unacceptable, and unprofessional in the extreme. I am now simply waiting for my stuff to be available again so that I can get it out and walk away. I’m certain that new users will be happy with it, but I’m gone. Badly handled, very badly handled. I keep swinging back and forth between Evernote and Springpad (now using Evernote); however, after reading your review I am now (again) checking out springpad. You’re trying to compare apples, oranges, and banannas…. Evernote is an incredible second-brain-in-the-sky product. Pinterest is a photo blog one-trick pony. Completely different things that exist for different reasons. I think that a lot of the user base frustration can be dividied into two broad concerns. The first has to do with the way the rollout was handled. Due to the bugs with the rollout People have not been able to access their data. Instead of giving users some advance warning to perhaps do a back-up or that the service could possibly have some stability issues they deliberately chose to have a “Press Embargo” and not tell anyone. Clearly the goal was to have a media splash. Unfortunately, someone felt that media buzz was more important than ensuring the users were prepared. Now that the service does not work well these users feel betrayed. They cannot access the data they entrusted to SP and for many this impacts how they make their living. Second, thee are some fairly boneheaded Functionality changes they made. For example, they disabled offline access through Chrome. This was a great feature for mobile professionals who wanted to get things done while on the go (Airplane or other place without a net connection). Even the simple process of creating a new note got more complicated. On the “Old” SP you directed your browser to the SP homepage and clicked on the “Add” icon and started creating your note. When you were done you just selected the notebook(s) where you wanted to store it and added tags. Bingo You were done. Now you have to pick out a notebook first. Then you have to go to the smartbar to add something. That opens a new screen/frame where the Title of the note is now the text of the note. You may have to delete the existing text in order to write your new note. You can add tags or add it to another notebook. But the Icons for “Save” are not intuitive (A Check mark?). Furthermore, there is no way to cancel creating an item. Even if you want to stop creating and click on the back arrow on your browser SP still saves it. Now you have to find it and manually delete it. I don’t plan to use the social features, but I can see how they can benefit others. The loss of key functionality is something that is driving many existing users crazy. And the workflow needed to do things that were previously one or two mouse clicks is not often 5 or 6 clicks instead. But perhaps the worst things I see is that they launched this with absolutely NO HELP DOCUMENTATION. How does any company do a complete makeover and then just through it out there and say “Have fun figuring it out”. If they had put together a set of tutorial videos it probably would have helped a lot. After several days of stumbling around I have figured out how to do things in a new way. That should never happen. Let’s face it, the more you make your users click their mouses the more you are making the use of your web app dependent upon the speed and reliability of the user’s internet connection. To me, this just isn’t a very wise thing to do. I haven’t abandoned SP. But the issues have been enough to cause me to look at alternatives. And frankly I am impressed by the recent updates to Evernote. If enough people do this SP is going to have to get a lot more NEW users to backfill the the number of eyeballs they will lose that help them generate their revenue. Very insightful comment, Chuck. I agree with you entirely that the rollout should have actually been a rollout over a bomb drop, and there are definitely some things that could have been handled better. The disabling of offline access in Chrome is disappointing — my guess is it will probably come back (or they will finally let people have the much yelled/whined for desktop app). But you’re right: there is altogether too much guesswork. Things should have been much clearer, with documentation/tours and the ability to try the new Springpad for a while before the change was final. I don’t think they would have lost any media attention as a result. After all, the new users would still have the new interface. That approach would have, by necessity, limited the functionality they took away, as well. Personally (and as I said further up), I like the new look, and haven’t been adversely affected by the changes — but my use of Springpad over the past year or so has been closer to what the new version is trying to achieve, anyway. Oh — and the clipper… I hear you, man. The adding things even though you cancel has always been an issue, though. Try the bookmarklet. It smooths things out a bit. Great Review, very balanced, and great insight. I have been a SP user for a while, but only very light user, but I use Evernote heavily. I may end up being a SP convert, I like the new social notebook thing. The only thing that holds me back from that is having an offline client for my Mac and PC. I use both Springpad and Evernote, for different reasons. If Springpad had a desktop app that allowed me to both import my EN notes and (most importantly) to quickly open a new, autosaving note window (standalone) with just a keyboard shortcut, then that might change. Don’t know that I see that happening, though. I suspect (see: hope) offline access will come back to Chrome, soon, if that helps. – Attached files should now be available on the web (will be available on mobile soon), but they are a bit hard to find. You’ll see them at the top of the page, then you’ll need to select your chosen attachment & click on the big file icon to download it. We’ll make it more obvious soon. Great review bobby. I agree with you, the new design is incredible. Simplicity is the key after all. But like you said, having a do it all product is indeed intimidating. Am only guessing here but I suppose the people at Springpad were mostly targeting users for home use. Though it might sound like a good idea to have a horizontal solution with extended functionality, I think people appreciate more vertical solutions that do one thing really good (like on the note-taking part Evernote is the king with its advanced search and desktop solutions ). Then with vertical solutions you have the problem of trying to integrate everything. It depends on what I need it for. I dislike having to log into, or even open multiple apps to get through certain aspects of my workflow. However, there is rarely a substitute for niche expertise when you want an aspect of something you need done right. The best solution is better integration protocols, wherein suites of apps band together to accomplish certain ends, or allow you to more easily connect the different apps you want to do what you need. A standardized interaction layer for all apps… Call me a communist, socialist, or whatever, but I would love that! Am with you… standardized interaction layer for all apps :-). Do you know if there is any effort in that direction by anyone? Not that I’ve seen — not with any traction, anyway. The closest I’ve seen is on Google Android. It’s not perfect, though, and it doesn’t allow for other OS’s. The likelihood of anything like that happening is not that high — at least not right now. There are too many competitors that don’t find it in their best interests to play nice with others yet. New design is VILE, overplaying on the endless sharing / being / loving cr*p that seems to permeate every inch of webspace. This is NOT why I started using SpringPad. If they gave me the code of the old OS then it would be interesting to see how many people would prefer to go back to what they had before they weren’t asked what they wanted. If a bunch of users got together and built their own throwback to the original Springpad (or the last version, anyway), it would be intriguing, for certain. I still like the new design, though. Why should we have to develop it all again? If the people at SpringPad are so confident in their new system then they should ‘gift’ their ‘inferior’ V2 source code to the opensource community. There are people out there who have realised the folly of sharing everything on-line. I don’t need to see a blow-by-blow account of ‘friends’ lives and the homogonised gloop that social media is creating is a shallow imitation of real life. This seems more like an anti social network comment. Don’t get me wrong — I hear you and, for much of it, even share your point of view. However, the fact is that we can’t escape it, and companies that don’t embrace it are considered antiquated and are not likely long for this world. As I said in an early comment, if Springpad didn’t evolve, the likelihood is high that you would have found yourself (one day) with no Springpad at all, as opposed to a service with a slightly different approach. This is especially true considering the means with which Springpad makes its revenue (by making your content more useful to you via partners, as opposed to charging you). I don’t mind the new design. Its the functionality which pisses me off. What I could do things simply before now has been complicated with multiple menus etc. Why couldn’t they build on the great old version instead of trying to reinvent the wheel. Yuck. New springpad is slow and tedious compared to old. They’ve obviously changed strategy to pursue social billions. Somewhere I saw that denied by the company rep, which is a comical denial. Proof abounds, such as in this trifle: I used to flag items and put editable notes on them. Now “flag” is “like” and the notes are comments and aren’t editable. From the comments, I see that you are more of a “light” Springpad user and don’t use as part of your everyday workflow. Just curious as to what you use for your workflow/to be productive. A lot of us using Springpad for GTD were seriously affected this past week. I had been using Springpad for the last two years, and I’m trying to figure out if I should abandon it as my “one stop shop” (which I would hate) if realistically they don’t want to cater to the GTD crowd. I don’t want to be stupid and try to hang on, having to go through multiple steps to get something done just for the sake of everything being in one spot if there are a lot easier alternatives out there. Agree with you. Springpad has now become a difficult to use App instead of the easy way it was. More accurately, I’m a light Springpad user -now-. I’ve more than put the service through its paces. I think that the GTD implementation for Springpad that I put forward should still work — but I need to do a clean look at it before I can say that with confidence. How do you do your GTD in Springpad? Is it related to the the method in my past article? As for what I use now, my focus is on Producteev. The interface has been updated since my GTD in Producteev post, but it still works well for me — though it will be better once they recover the features -they- lost or disabled when they did -their- update… Seems to be a lot of that going around lately, eh? Another viable option is Wunderlist or Winderkit. Both are free, functional, and easy on the eyes — but no attachments, I believe. You may also wish to take a look at my GTD in Evernote post, or take a look at the GTD category in the top menu, here. There are several posts, some of them by us, and some by readers. There may not really be an all inclusive “one stop shop” out there — not without tweaking or making allowances in some way. Mostly, I focus on free options, however. There are some very good paid GTD-focused services like Nirvana, Nozbe, etc. My router failed on me this week which was bad timing as far as online apps are concerned, as I ended up pretty much relying on Calengoo for tasks and appointments, and Evernote for reference on my Android phone to get anything done. It’s made me reassess services like Gqueues which rely heavily on an internet connection, and to some extent Springpad as well. While 3G and HTML5 have been great leaps forward, in a Wi-fi dead zone the limitations have been pretty brutally exposed for me at least. Ironic because before this I wouldn’t have even considered Evernote over Springpad because as a free user I couldn’t access offline notes. Now it turns out I can use both in true native format with Evernote regardless of connectivity whereas Springpad relies too heavily on a constant connection via Wifi or 3G. While I am thankful I still had online access through my 3G phone, it’s only made me realise the limits of reliance on connectivity 24/7. @Bobby – I have been a Springpad user ever since I got my first Android phone. I loved the app and I always recommended it to all my friends & on all Android boards as the best Android app. The latest version 3.0 has ruined everything. I can’t believe they could roll out such a huge upgrade without testing it thoroughly first. I know SP have promised to iron out the bugs and change certain things but his has put a bad taste in the mouth. How could they release this version without testing it first??!!! I have waited with them till 3.0.5 but it doesn’t seem that they are going to roll back the bad functionality. What we could do with one click, now we have to do with many more. Instead of making things simple, they are making things more difficult for simple tasks. Collaboration etc is all well and good but why ruin a good working app with a great interface !!!??? I downloaded Evernote yesterday and am now migrating all my stuff from Springpad there. Thanks for the post Bobby. I also feel Springpad may be on to something with their recent update. Whether it be marketing, note taking, or productivity enhancements, people are looking for the magic bullet to fit all of their needs. True, the streamlined aspects of Evernote and Pinterest may have their appeal, but nobody wants to jump between applications if they can have it all in one package. By diversifying, Springpad may be holding itself back in the short term, but after they work out the kinks and make a layout that is easily navigated, they will jump ahead. Hi Ryan! Glad you enjoyed it! Hopefully they will be able to smooth out the kinks for the users who don’t like the changes, and get things on track to become the super-notebook they are aiming at. Hello, i feel that i saw you visited my weblog thus i got here to return the choose?.I am attempting to to find issues to enhance my website!I assume its adequate to use some of your ideas!! Not sure what you mean, hear — but thanks for visiting! How much did Springpad pay you for an obvious advertisement. If you were truly objective and did just a little research, you would find that not only does the vast majority of current users disagree, but they are out right pissed at Springpad for this move. Just as Apple thought they knew best in the early nineties so goes Spring Pad until they learn there lesson. Let’s keep the conversation to intelligent debate as opposed to unfounded personal comments that question people’s integrity, shall we? It only makes you look like an asshat. As for the rest of your comment, there are definitely enough users making noise to get Springpad to notice and try and act on their complaints — you may have noticed bits of conversation regarding that and the fact that Springpad handled the change rather badly here in the comments. You’ve read all the comments, right? Still, there is no evidence that the majority of Springpad’s users don’t like the upgrade. That would mean more than a million users expressing their displeasure — and that’s just not the case. People who have problems with something are generally more vocal than one who don’t, as well, so that skews things even more. So yes, enough negatives to make an impact, but not enough to change the landscape. For my fellow abandoned Springpad users… Checkout “Catch” It is reminiscent of early Springpad days and with a little luck (and support) the developers could grow it into a great app just as Springpad once was! Catch is a good service. Much closer to Evernote than the old Springpad, but definitely taking steps to differentiate itself. It definitely may be an alternative for note takers who don’t like the Springpad changes. Catch has a nice interface and some decent collaboration features — I don’t believe it does task management, however. A closer alternative for those who want task management in a pretty and free app would be Wunderlist or Wunderkit. They are a bit light when it comes to information capture, however, so you may need to supplement. Same goes with Producteev, which is a personal favourite of mine for task management. Any other useful ideas as to alternatives for Springpad users that can’t use the changes? I don’t believe these changes are going to attract more users. Nor do I believe presenting them with absolutely no instructions will retain current users. I believe they took an original app and then tried to copy various business models to make it more popular. This might worked had kept the simple functionality and provided added instruction for the features, but that didn’t happen. Furthermore based on your responses, you will never convince me that you are actually using this app. I use Springpad quite regularly, actually, but I stopped using it as a task manager well before the change. I never found it to be a good app for me in that respect, so I dropped it and moved on to something else, choosing to use it for its strengths as they related to my workflow: visual bookmarking, occasional collaboration, and as a shopping assistant. That’s not to say that the task manager side of things didn’t work for others, or that it wouldn’t work for me — just that I found something else that I preferred. I totally get that the changes may screw some people over in their workflow — and I agree 100% that the way the changes were introduced was very, very badly handled. It more than makes sense that the people who use the app to manage their workflow are shocked, angry, and ready to jump ship, especially when many woke up one morning to find their data gone — even if only temporarily. Springpad lost the trust of many users in one fell swoop. If they can pull up from that nosedive, though, to believe they will attract more users. It’s hard to say whether they will be successful, ultimately, with this particular incident dragging them down, but I won’t be surprised to see them around for quite some time yet. Well I think at this point, it’s a matter of communicating to users how the new changes work and getting rid of the bugs. At that point, I will at reasses if I can use it. I think it is another issue that even after the backlash, I have still not seen much in the way of communication from them. Their rating in the app store is plummeting by the day. Hopefully, they regroup and communicate their vision better to users in the future. I emailed them personally because I lost so much data and at best I got a terse response. I think users will be willing to be more patient with bugs/overhaul if they are made aware. In the meantime, I will try your task app suggestion. I agree that it is all about communication at this point. Some documentation and use cases would be helpful as well. I may do something like that in the near future. In the meantime, Daniel Gold’s eBook may be a good option for some — but I would understand if the thought of paying for something related to Springpad would be an irritant for you at this point. Daniel, himself, is a good resource, and generally more than willing to share what he knows. Who did you contact at Springpad? My experience with their support is pretty positive, especially with Katin. It could be that you caught someone suffering from an overload of angry emails — not that that is an excuse, of course. I’d suggest trying Katin again, if you can. If you have questions regarding my task manager suggestions, especially Producteev (I’m most familiar, here), then please feel free to ask here or email me directly. I don’t remember who emailed me and I don’t have access to my work computer right now. I would agree that previously they have always responded in pleasant manner. So maybe it was someone who had received several hostile emails. It was definitely not Katlin. Katlin is always nice. I will let you know if I have questions about Producteev. Thanks for your help. Katin is one of the best community managers I’ve come across — very dedicated to her work. Like you I found Springpad difficult to implement as a task manager and I’ve used other solutions to this point. The lure has always been there to try and get Springpad to work as an all in one solution, as it’s being marketed.I have been giving it another run with the relaunch and to be honest, it’s hard work. Capturing items in both web and mobile is slow…which is a shame because the android app was very quick before. I still think it’s worth persevering with though. I’m hoping that once the glitches are ironed out implementation will be a lot smoother. While it’s easy to see why people are so frustrated, on the flip side this is such a powerful app for free. It just needs some tweaking for usability and it would be ahead of most paid apps in my opinion. Evernote is a great and (now) better alternative to SpringPad (the latest version). I never got around using Evernote as I loved the (old) Springpad. Now that I have transferred everything to Evernote, I find it a great alternate app. Probably in some ways even better than the old Springpad. Thanks for weighing in, Buzz. Evernote has definitely added some flexibility, but it is not capable of doing half of what Springpad can do (old or new). That said, however, it is still the better place for general note taking, and it uses the power of minimalism to great effect. How did you find the transfer? Did you email everything, clip from Springpad web pages, manual copy and past, or…? Evernote has a great web interface. I just kept my phone open to the Springpad note on my phone in question and typed it into the Evernote web application. It was tedious, but now I’m happy with Evernote. It’s true, some things in (the old) Springpad were easier than Evernote, but overall, I think Evernote is much much simpler & easy to use than the new Springpad. I’d like weigh in, from the perspective of a new user. For all of you saying that ‘no one’ will like the new design, and that it won’t garner any new users, please stop making generalizations. I have been an avid Evernote and Pinterest User, and am now making the switch to Springpad purely BECAUSE of the new design. Why? Because for curation, organization, light note taking and task management, it’s a near perfect marriage of the two. categorising items (ie. recipe, bookmark, movie etc). I love Pinterest, but it really is about book marking and the social stuff. The new Springpad, with a ‘pinterest -inspired’ interface, is FAR FAR more powerful (& quite different) than Pinterest. 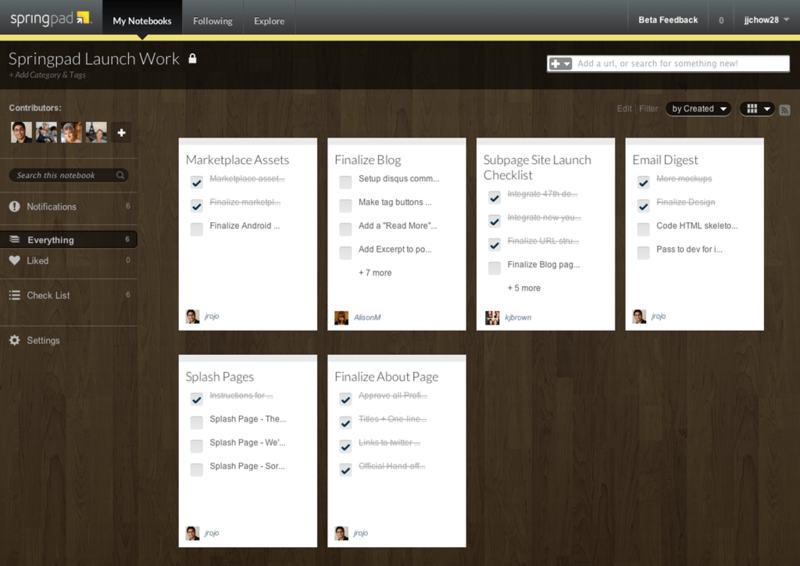 I also love Evernote (I pay for the Pro account), but the layout doesn’t make me ‘want’ to work with it. It’s boring, it’s ugly. It is also nowhere near as good for collaboration as either Pinterest or the new Springpad. I will still be using Evernote as a digital filing cabinet for my ‘boring’ stuff (like records, receipts, copies of PDFs & images so they are searchable, etc). But everything else is so much more useful, easily organised, & visually appealing in the new Springpad, so I will be migrating my 1000+ Pinterest pins and many of my Evernote notes onto Springpad. I’ve also finally got my boyfriend using a service to collaborate with me! I could never convince him of the useful-ness of Evernote or Pinterest (yes, he tried both) he just wanted to use shared folders in Dropbox all the time. We have started planning a Europe trip using Springpad now, and even he admits it is useful! Now, I understand that if you were using this heavily for your own user- generated notes, or heavily for task management, the new design might not be as powerful. And of course I agree the app is far from perfect (I’ve been logging my irks on the Get Satisfaction boards). I also agree the rollout was clearly pretty abysmal, but don’t confuse poor release management with a poor product. With a little time to work out the kinks, the new Springpad will have it’s own niche and could be very very successful. Just to add to what Telisha has said above, while Springpad isn’t the most intuitive for task management, the plethora of other functions it offers make it a hugely impressive piece of kit in it’s own right. That too for free. Personally I use a dedicated task manager for tasks because I need speed of entry for new tasks and calendar integration for the way I work. But I’m definitely considering Springpad for project and reference notes again. I love the fact you can now filter which notebooks you can now see on your screen by category or tag, in theory anyway. Collaboration might not be for everybody but it will certainly be useful for many. Evernote is a great app in it’s own right but for those who want everything in one place Springpad is still leading from the front IMO. If they could make the task management side a bit more intuitive I’d be more than happy to use it for everything. Thanks AJS, I am glad someone else shares my sentiments! It truly is leading the pack in the all-in-one solution IMO also. Agree that with a few tweaks, I’d happily use it for everything as well. The only reason I am keeping my Evernote for certain things is because I like the OCR, searchable PDFs, offline/desktop capability, & hands-off workflow I have with watched folders in Dropbox adding files to Evernote. If Springpad implemented OCR & offline capability (even partial, ie flag certain notes for offline access), that would be enough for me to ditch EN completely (i’d live without searchable PDFs & watched folders), and other than visiting for inspiration, I plan to ditch Pinterest as well. I’ve also stopped using my iPhone notes & Reminders (mostly) in favour of using Springpad. So for me, the new Springpad has allowed me to replace 4 apps with 1. Depending on the features they bring out in future, I could potentially cull another 1 -2 iPad apps as well. Neither Evernote, Pinterest, or Dropbox ever allowed that kind of streamlining for me. It’s also a good point you make re: dedicated task managers. I have always been of the opinion that if a user needs a particular area to perform exceptionally well, they should use a dedicated & purpose built app/service. Springpad, Evernote, Pinterest, and Catch, are not (and never were) marketed as being ‘task management apps’. Yep, they all can do it, but it was never their main focus, so it’s understandable that their task management isn’t as intuitive as it could be. Personally, for task management of my personal stuff, Springpad will be sufficient in it’s current form. For work, it’s easier for me to keep everything in the MS Outlook emails/tasks/ calendar + SharePoint set up (since I’m forced to used those anyway, unfortunately). The addition of OCR would be fantastic — the one thing I want from Springpad though, is the ability to open a note in its own window, especially by desktop shortcut. Very important for my personal workflow — on a computer, anyway. Thanks AJS! I agree with your assessment. I do understand the issues some people were having, but overall, I still find the update a step forward. I’m curious what sort of real numbers they’ve had in respect to user drop off and new adoptions. Just visit the Google Play store. Check out the recent (post 3.0) ratings. And see the installed graph which dips hugely after this 3.0 update. Checklists, which I use as packing lists, are still not searchable for items. What a shame, stiil can’t use Springpad to tell me which box my Jetboil is packed in and it seems like such a simple thing. Agreed with most of the negative points. I am frustrated too. However, my love towards Springpad still intact. I’ll wait for fixes and improvement. But it won’t be long to switch since it has impacted productivity for quite sometime. Two months into Springpad 2.0 I thought I’d revisit this topic and share my thoughts after living with the changes for awhile longer. I have learned to reluctantly live with the limitations of the new version compared with the old version. I have even considered using some of the sharing features now to push some stuff out to others without having to add a step of creating an e-mail. While I haven’t done that yet, I can see it happening before too long. In that sense the new features are a plus for me. I have found that for accessing info and creating new tasks or checklists the Springpad Android app actually functions exactly like I want the web app to function. I have a widget on my Android screen and I have one button access to create specific types of “Springs”. Why they don’t offer this on the web app is beyond me. It is a HUGE productivity feature. However, there are still some glaring usability issues. 1 – Way too many clicks required to add something new. Filing something you clip form the web using either the extension or the clipper should be a lot easier. You still have to crate the “Spring” and send to SP, then go to SP, open it and manually edit it again to assign it to a folder. 2 – Still no offline access. I use SP for work and when I am on a plane it sure would be nice to work with my SP data. The Mobile app does store data offline, so that is some solace, but it would be nice to work on a bigger screen. 3 – Tasks and reminder system still has a bunch of glitches. When you create a task with a due date you cannot set a specific time and date for any reminder. But if you don’t have a due date you CAN set a specific time for a reminder (but you lose that reminder if you then assign a due date). ALso, task due dates and reminders are not flowing to Google Calendar, so I end up having to manage two task systems. This lack of integration with GCal is how I stumbled onto Any.do (Which I really like). I still use SP. I just have to use it differently. And I cannot do all the things I used to be able to do with SP. I sort of fell like I took my car into the shop to get a tune-up and when the car came back they had taken out the back seat and the radio. The engine runs well – better than it ever did. But now I can’t take my kids to school or listen to my King Crimson 8 tracks. NIce description of some of the issues. I never used the old version of Springpad and was attracted to the various feature of the new version that supports private sharing and collaboration. So I didn’t suffer the feeling of remorse that many of you did. The new tool is, in theory, exactly the kind of tool that I need to reduce the set of tools that I require to support collaboration on the front end of projects and potential projects. Unfortunately, the interface is often inconsistant making the mastering of the tool much more challenging than necessary. Worse yet, there are deficiencies – in fact I would call them glaring bugs – when using the iPad app that totally ruined the experience for me. The people that I wanted to collaborate with me over this tool, would not tolerate this kind of UI. They are all heavy users of Apple products for a reason. They should simply bring back the older version as “springpad lite”. I HATE that new version. In fact , I’m looking for an alternative if there is, before switching back to Evernote that at least is intuitive and WORKS. @Pete Flent – Switch to Evernote. I find it much better than the old SpringPad too. Sorry but I absolutely do not like the ‘updates’. The amount of useable screen real estate shrunk dramatically, the new gray on gray color scheme with smaller and lighter font makes it much harder to read notes even on my 24″ work monitor. The main task of saving, accumulating and reviewing various types of information got much harder. There’s now a ton of new social sharing tools that neither I nor most of the people I interact with care about – it was easy enough to share notes before. The interface was drastically changed, impacting our ability to work with our data, without soliciting any input from users and without giving us an option to switch back to the old design. The manner in which it was handled is the worst part. Usually I don’t read article on blogs, but I wish to say that this write-up very pressured me to check out and do so! Your writing style has been amazed me. Thank you, quite great article. I recently discovered Springpad and was really impressed by the flexibility and features. I was looking for an Evernote alternative + some extras, and Sprinpad seemed to fit the bill. I think your article clearly laid out some of the advantages. Nice article, except for one aspect — privacy. I was looking for a good tool for collaboration on work projects, but that could also be used for getting info out to the public. Springpad fit the bill. But then I realized in my test that the DEFAULT for setting up a new notebook on the web is public, not private, with no way for the user to change the default. That was disconcerting, but what I found in the support forums was even more troubling. In addition to not seeing any promise by the company to make this simple change, it also was apparent that when they made the switch they chose a default that had dire consequences for some users. According to forum users, the previous version allowed for private sub notes to exist within public notebooks. I can see how this might be confusing and cause issues, and why Springpad might move to the new model of a single setting for an entire notebook. But what is really inexcusable is that they made a switch that made private data public, rather than choosing a transition that would play it safe and make public data private. This created an ugly situation for some users. The ONLY reason for a company to make a decision in this direction is to maximize the amount of public data. The safe route would have caused a sudden drop in the amount of public notebooks, something their current model relies on for success. In my mind, I can never use their tool, no matter how great, because I can no longer rely on the company doing the right thing for their users in respecting their desires for privacy. It once had promise to be an incredible collaboration tool, but this one blunder will relegate it to the likes of social apps that have little regard for user privacy. What a shame. I am a writer and, so far, honestly I prefer Evernote to the Springpad. When I use Evernote it had a familiar Microsoft Word feel (on the computer). I often times have a hard time adjusting to new applications and their obscure layouts and Evernote was just a tad easier, but comparing that to the other apps on the market, at least I can understand what I’m doing. I’m not fond of using many apps. I like sharing on Facebook, but that’s not all I do. I like writing on Evernote because it can store all my longer “short stories”, and my oddly shaped formats. My best friend, who is also a writer seems to find that Evernote also makes a very good personal diary, which he does not allow others to see. Springpad on the other hand has become sharing-based, it’s new format confuses me, and with everyone’s comments (since I only tried it once and then uninstalled it to make room for another app) it seems like a Tumblr Reblog-Whore site. Pardon the language. Sharing and sharing, and commenting, and liking. It’s all social, that it either distracts you from what you’re going to do, should you have a different purpose with regards to the app rather than sharing, or it’s somehow simply a place that reminds me of why I abandoned Tumblr in the first place. Too many people, too much crap, too many people reblogging stuff like that. Not that that’s a bad thing for the website, though, the masses of the online populace would surely bring them tons of cash from their advertisers. I just find that as soon as the online masses flock to such a place, especially a sharing based site/app, it gets a lot more complicated, adding to the stress of already trying to understand the app (and their “unique” terms: eg. Like for Facebook = +1 for Google+ = <3 for Tumblr). I’m confused as to where the actually comparison is. I read this to find the pros/cons of each, and I only found an article touting the strengths of springboard. Can Springboard or Evernote import boards from Pinterest if I want to just use one of them?